The floor of Goldstream Valley is permafrost, marsh, and tiaga. 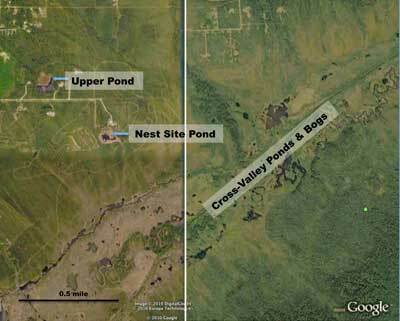 Several crane pairs nest in bogs in the valley. 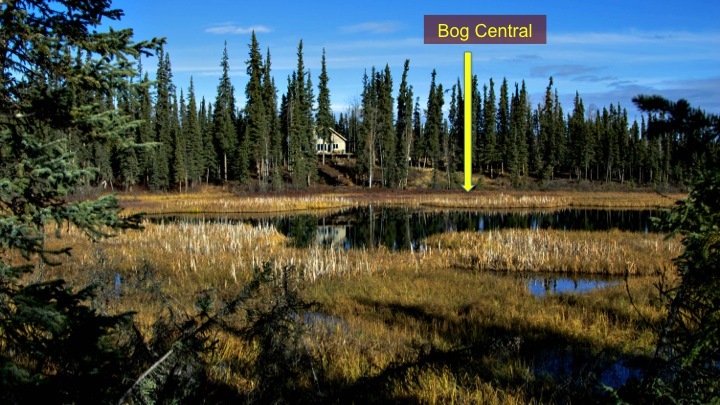 The pond is bordered by marsh and bog which is surrounded by black spruce tiaga forest. The pond was formed by the collapse of an ice lens (see " Pingo" in Wikipedia). The nest territory, looking south from our house - May 11, 2000. Incubation usually begins around May 4. The eggs hatch in 30-31 days. In 2000, the pond was ice-covered for the first two weeks of incubation. Roy and Millie usually return at the end of April when the pond is still frozen and snowpatches persist on the bog. 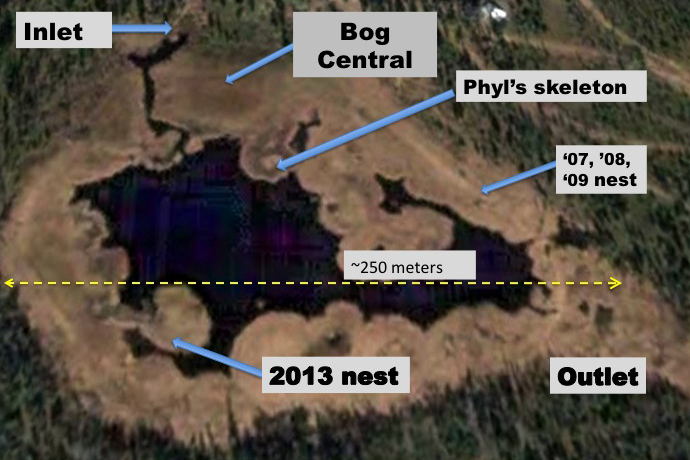 The first week back is devoted to inspection of potential nest sites around the pond as well as short walkabouts (less than 1 km) into the surrounding taiga. Bog-Central is beyond the woodpile in the right center of the photo. Colts hatch in early June. For 13 weeks after the eggs hatch, both parents are occupied with care and education of the colt(s). The marsh bordering the pond is squishy sphagnum/sedge/grass/cattail. Bog-Central is covered with high-bush cranberry and therefore the best surface for dancing, running, and preflight run-flap coaching. Nightime temperatures dip below freezing in late August, and the family leaves for migration in the first days of September.